This week was the kickoff of the BPM Open House event online. 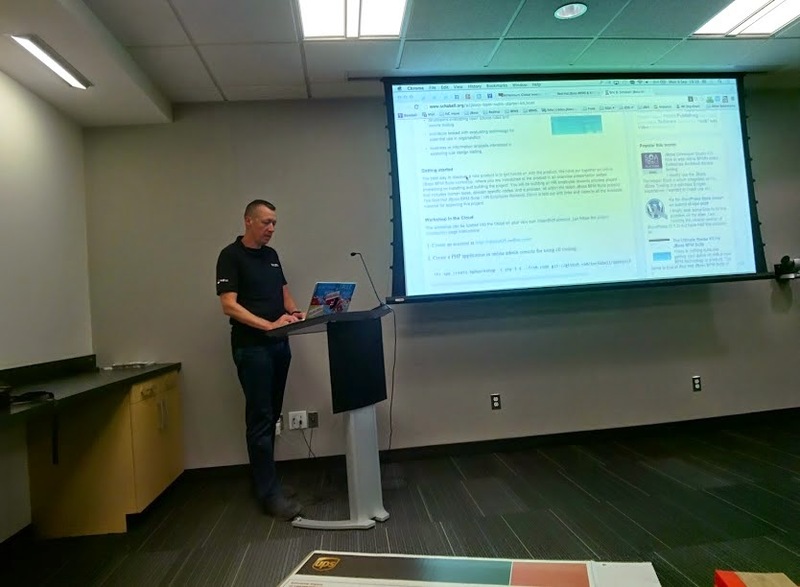 While I posted earlier that there were a number of reasons to attend, the biggest was to enjoy the overview and live demo given of JBoss BPM Suite on both local and bpmPaaS on OpenShift. Before we give you the promised resources, a short recap of the event and our sessions. We delivered our session live before a worldwide audience and opened with the following by Luis Cortes. BPM is no longer only about improving efficiency and productivity. According to leading analysts, 85% of organizations report that their primary objective for BPM is achieving faster growth and improved capabilities for change. Meanwhile, where once traditional BPM systems were too expensive and too complex for mid-sized businesses to setup and use now because of cloud computing BPM is becoming more accessible to a much larger audience. So how can Business Process Management help your business quickly adapt to changing business requirements? There was then a live demo session where I walked through the various aspects of a financial project showcasing rules, events and BPM. Finally I showcased the same project in bpmPaaS, a cloud deployed JBoss BPM Suite. It was all based on the following outline. Looking for improved business agility, operational efficiency and time to market? This demonstration, focusing on a loan origination scenario, will take you through how you can quickly model, simulate, test, deploy and improve a working example using JBoss BPM Suite’s web-based tools. JBoss BPM Suite is an open source business process and decision management platform that enables users to capture business policies and procedures, accelerate application development and automate business operations across physical, virtual, mobile and cloud environments. 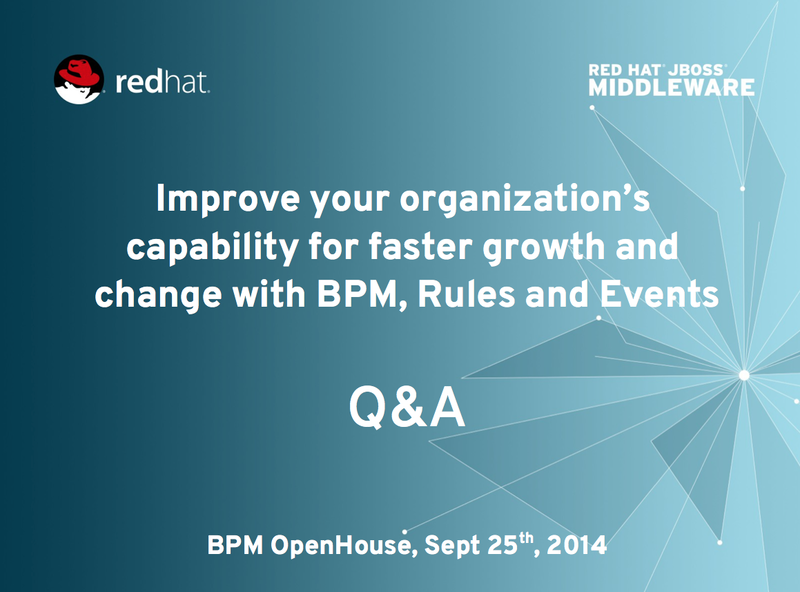 We promised four resources that were not to be missed at the BPM Openhouse. There is a new and interesting Java based conference that is gaining in popularity rather quickly. It is called JavaLand and in 2015 it will be hosted on March 24-25th in Phantasialand, a theme park with great facilities located in Germany. 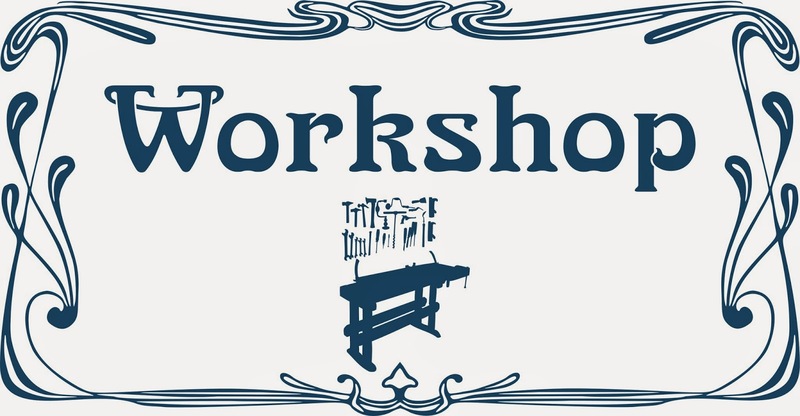 I am interested in bringing to you a full immersion experience with hands on workshops for xPaaS, rules, events and BPM. We will build all things cloudy and BPM enabled if these submissions are accepted. You have to admit, the location is pretty special so hope to join everyone with the following lab based workshops. Ready to add something new to your development toolbox? With this workshop you get a chance to do just that, unlock the power of business rules engines and business processing for your development projects. We will take you through it all step-by-step, building rules, domain specific languages, events and BPM to create a real life project of your choosing. Choose from an online web shopping cart experience or an HR employee awards approval process, it's all up to you. This is a hands on session that takes you from zero to a fully working project based on JBoss open source software. An extra bonus will be an option to run your project on a real life PaaS experience as provided by OpenShift. No time like the present to accelerate your projects into the Cloud! A fantastic webinar is being hosted this week on JBoss Business Resource Optimizer, a tool used to ease the planning of your business resources. 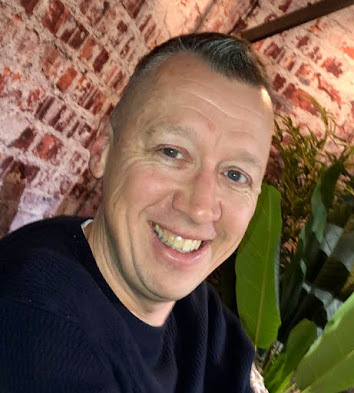 The tour will be given by none other than Geoffrey De Smet, senior software engineer and OptaPlanner community project lead at Red Hat together with Phil Simpson, principal product marketing manager at Red Hat. Geoffrey has vast experience at modeling, solving, creating and executing optimization tooling for these complex problems. You don't want to miss a chance to hear him expound on the various aspects and challenges that they are able to meet for your business. Be sure to register before the event, to be held on Wednesday, 24 Sep 2014 at 11:00 ET (11AM ET) / 17:00 CET (Paris). The world is full of planning problems—scheduling employee shifts, assigning delivery cars to routes, scheduling classrooms for course exams, and assigning manufacturing tasks to machines—just to name a few. Each of these problems can have dozens, or even hundreds, of interconnected constraints. Solving such problems optimally is key to your business success. The technology and knowledge to do so has been available almost exclusively to large enterprises. Until now. Powerful—yet accessible and easy to use—tools are now available to help any size enterprise optimize business resource planning. When to choose heuristic or metaheuristic optimization algorithms. How to overcome scalability challenges. How to quickly solve a wide range of common planning problems using the OptaPlanner planning engine and advanced rules engine functionality in Red Hat JBoss BRMS. This episode of tips and tricks will help you to understand the best way to initiate your process instances for your needs. Planning your projects might include process projects, but have you thought about the various ways that you can initiate your process? Maybe you have JBoss BPM Suite running locally in your architecture, maybe you have it running in the Cloud, but wherever it is you will still need to make an informed choice about how to initiate a process. Build & Deploy button top right. In the interest of completeness we have to mention the ability to start a process instance exists in the form of a button within JBoss BPM Suite dashboard tooling. When logged into JBoss BPM Suite and you have finished project development, your BPM project can then be built and deployed as follows. The next step is to start a process instance in the process management perspective in one of two ways. Process definitions has start icon in right corner. Both of these methods will result in a process instance being started, popping up a start form if data is to be submitted to the BPM process. Assuming you are going to be calling for a start of your BPM process after deployment from various possible locations we wanted to show you how these might be easily integrated. Details view of process definition has 'New Instance' button. 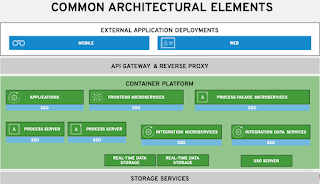 It does not matter if you are starting a process from a web application, a mobile application or creating backend services for your enterprise to use as a starting point for processes. 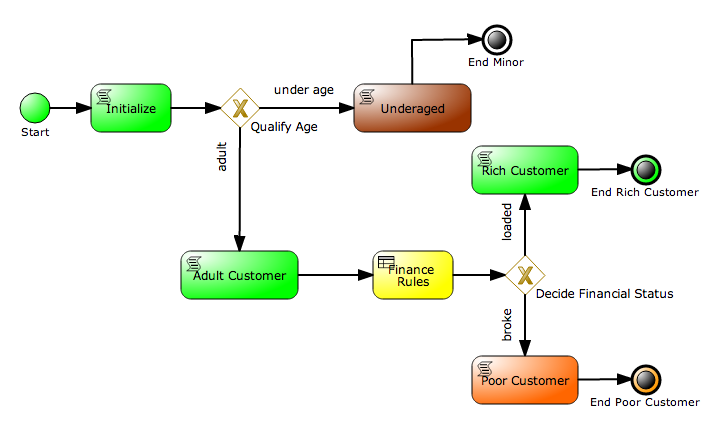 The exposed RestAPI provides the perfect way to trigger your BPM process and can be show in the following code example. This example is a very simple Rest client that, for clarity, will be embedding the various variables one might pass to such a client directly into the example code. There are no variables passed to the process being started, for that we will provide a more complete example in the section covering a client application. It sends a start process command and expects no feedback from the Customer Evaluation BPM process being called, as it is a Straight Through Process (STP). // start a process instance with no variables. * Start a process using the rest api start call, no map variables passed. The basics here are the setup of the business central URL to point to the start RestAPI call. In the main method one finds a method call to startProcess() which builds the RestAPI URL and captures the data reply sent from JBoss BPM Suite. To see the details of how that is accomplished, please refer to the class in its entirety within the JBoss BPM Suite and JBoss Fuse Integration Demo project. An easy way to test your process once it has been built and deployed is to use curl to push a request to the process via the RestAPI. Such a request looks like the following, first in generic form and then a real run through the same Customer Evaluation project as used in the previous example. For the Customer Evaluation process a full cycle of using curl to call the start process, authenticating our user and receiving a response from JBoss BPM Suite should provide the following output. Enter host password for user 'erics':  bpmsuite1! Results of our testing with curl. We see the process instances complete in the process instance perspectives as shown. The third and final way to start your JBoss BPM Suite process instances is more in line with injecting a bunch of pre-defined submissions to populate both the reporting history and could be based on historical data. The example shown here is available in most demo projects we provide but is taken from the Mortgage Demo project. This demo client is using static lines of data to be injected into the process one at a time. With a few minor adjustments one could pull in historical data from an existing data source and inject as many processes as desired in this format. It also is a nice way to stress test your process projects. We will skip the setup of the session and process details as these have been shown above, but provide instead a link to the entire demo client class and leave these details for the reader to pursue. Here we will just focus on how the individual start process calls will look. As you can see the last line is where the individual mortgage submission is pushed to JBoss BPM Suite. If you examine the rest of the class you will find multiple entries being started one after another. We hope you now have a good understanding of the ways you can initiate a process and choose the one that best suits your project needs. In this article we wanted to share another configuration property that can provide surprising help when setting up your JBoss BPM Suite. Previously we outlined a basic set of configuration properties to provide you with a few tricks when installing your own JBoss BRMS or JBoss BPM Suite products. As the JBoss BPM Suite is a super set, including full JBoss BRMS functionality, the rest of this article will refer only to JBoss BPM Suite but apply to both products. In this article we will show you how to modify your JBoss EAP container configuration to point the products at a custom deployment repository by adjusting a single configuration property. The default setup is that the products will look for your maven setting in the default settings.xml as found set in the M2_HOME variable or in the users home directory at .m2/settings.xml. The following system property can be added to JBoss EAP standalone.xml configuration file to point to any file containing your custom settings. Location of the maven configuration file where it can find it's settings. It should also be mentioned that by taking control of the settings for your remote deployment repository you also now have control over the (remote) repositories from which you pull your dependencies. For example, we can now point to repositories within your enterprise to provide JBoss BPM Suite with existing data models. When initially setting up the product for use on JBoss EAP containers, one can adjust configuration with the help of system properties. We hope this helps you with configuring your own custom deployment repositories and enables you to tie into existing continuous integration infrastructures that might exist in your organization. There is nothing like seeing the results of a good project come to the screen when you run it the first time. This is also the case for those of you that have been following along with the online BPM workshop series that has been published here over the last few months. With the final week and lab completed you are ready to build, deploy and run through the HR Employee Rewards process to see how it all looks. In case you missed this series, we proved some of the links to get you started. 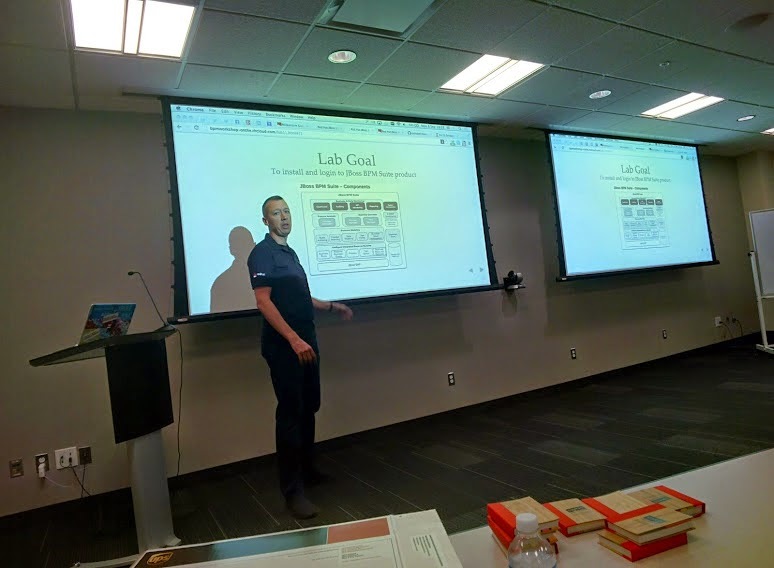 The first series of labs (1-10) focuses on JBoss BRMS and building rules, events, and ruleflow artifacts to launch your very own online retail Cool Store. The second series of labs (11-17) puts you through the paces of creating an HR Employee Rewards process. Yesterday evening in Peru timezone and middle of the wee hours of the morning for me here in Europe, we held a BPM workshop online for the Peru JUG. This is the second continent where we have toured with our online BPM workshop series, next week we take it on the road on the east coast of North America. If you would like to have this workshop series stop in at your local event, just let me know as I am happy to bring rules, events and BPM to your area. 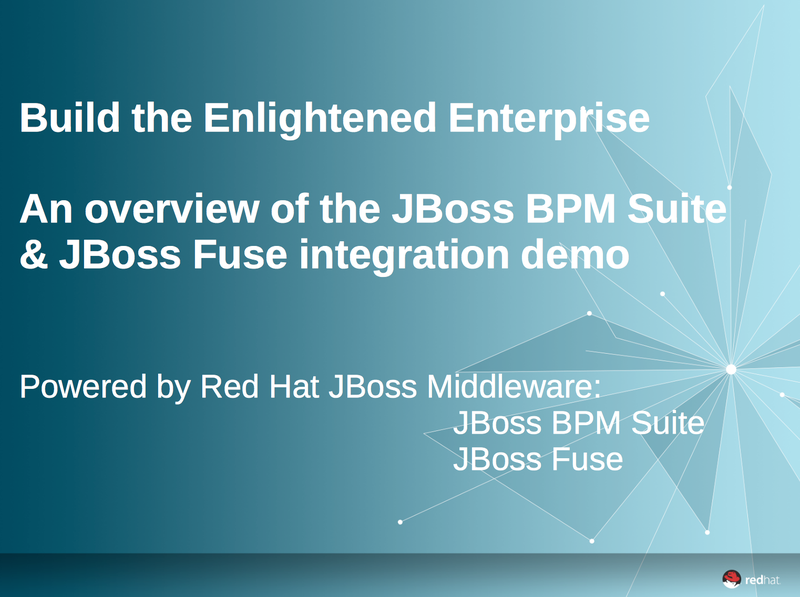 This week we bring you a new demo project to highlight the integration possibilities between Red Hat JBoss BPM Suite and Red Hat JBoss Fuse products. These products are used to get you started integrating your BPM projects with your Apache Camel architecture in minutes. This initial announcement provides an automated installation (repeatable) in minutes where you get JBoss BPM Suite running on an instance of JBoss EAP and a separate instance of JBoss Fuse in its very own Karaf container. 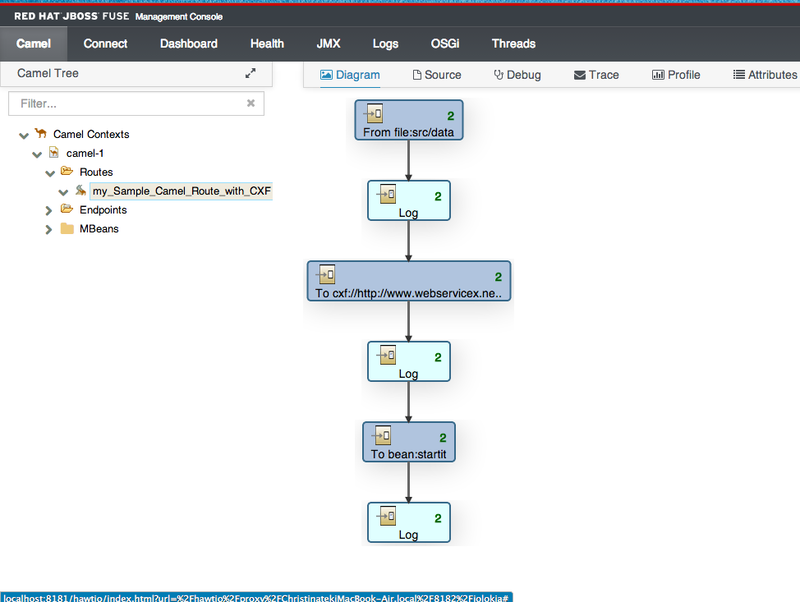 There are plans to expand this demo project with various integration scenarios or use cases, but for now we start with just a single story around using a JBoss Fuse camel route to interact with a rules and process project deployed onto JBoss BPM Suite. This demo is brought to you in part by our very own Christina Lin who is the JBoss Technology Evangelist that focuses on JBoss Fuse & messaging products. There will be more expansion and if you have a use case you would like to see then just let us know. The project can be found on github and has documentation to get you up and running in minutes. Upon starting the server you will find a JBoss BPM Suite setup with the Customer Evaluation project ready for you to inspect, build and deploy for use by the JBoss Fuse camel route we will deploy. The JBoss Fuse component of this demo consists of setting up a new container to deploy our camel route into, where we then watch messages get processed live in the management console as we push them into the waiting queue. Each message will trigger an external call out to the deployed BPM process to evaluate our customer. 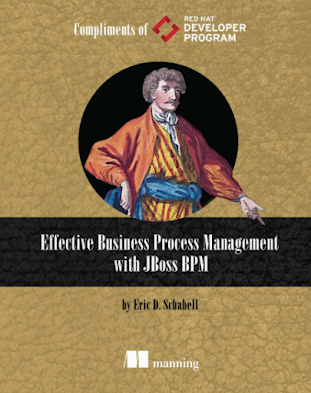 Start the JBoss BPM Suite server, login, build and deploy JBoss BPM Suite process project at http://localhost:8080/business-central (u:erics/p:bpmsuite). 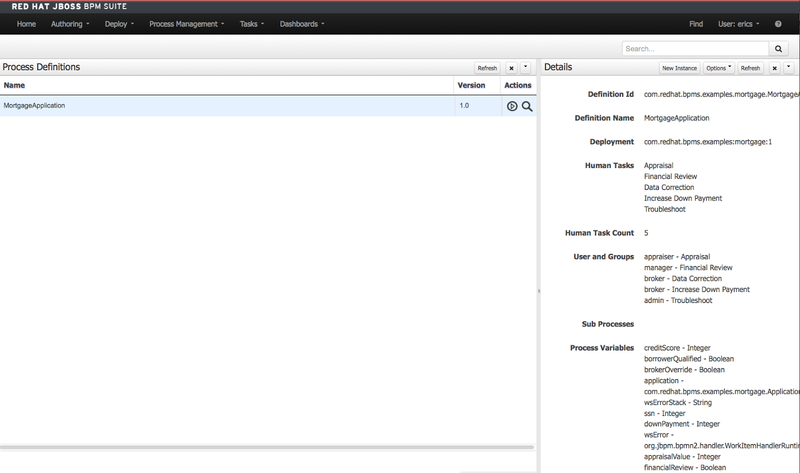 We hope you enjoy this new demo showcasing JBoss Fuse integration with JBoss BPM Suite. With that in mind I submitted two hands on talks in the labs category, of which one got accepted as a University talk. This will be a three hour lecture style session where I will take you through the hands on material and you can follow along as you see fit. The session will be scheduled for Monday or Tuesday of the Devoxx week, so watch the schedule for exact times and location or refer back to this article which I will update when more is known.